The taco/sushi talk – visualized! 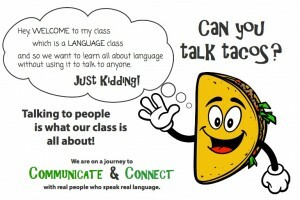 If you’ve enjoyed using – or considered using – the taco talk to help novices and intermediates (and their parents) understand what it means to learn for proficiency, you’ll love this resource. Many thanks to Iya Nemastil, a Japanese teacher in Ohio, for taking this idea and putting it in a beautifully visualized form. I’m betting you, your students, and parents will love it. Worth printing poster size and posting on the wall? You bet. Download the documents on Iya’s website here. What a creative way to communicate the idea of language proficiency to students! I am so impressed and love this visual and idea of SUSHI talk! Thank you for sharing your inspiring work. And thanks to Iya for visualizing it so beautifully for us!